Rightfully so, the food service industry has high standards for the cleanliness of employees and health of those that they serve. 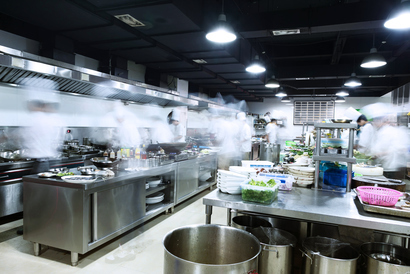 Specifically, when it comes to clothing and uniforms, what food service professionals wear is a major component to creating a fully hygienic environment. Hazard analysis and critical control points, better known as HACCP, are a system that helps businesses in the industry maintain safety from biological, chemical, and physical hazards. For the protection and safety of employees and the health of customers, there are five essential elements that uniforms must feature. Clothing that uses snaps to close instead of buttons is ideal for the food service industry. They are much less likely to become loose and fall off as buttons often do. A loose button could become a hazard by falling and becoming a slipping hazard, collection germs and other bacteria from your surroundings, or even falling into the food itself. Snaps are much easier to clean and make the garments easier to get into and out of in case of an emergency. It’s important that the food service uniform be well fitted to the employee to aid with efficient and safe movement. They are also more comfortable and help prevent spills from garments that are too long or too loose. It may seem like an odd detail, but uniforms without pockets help rid the workspace of unnecessary and unhealthy contamination. Without pockets, it eliminates the opportunity for employees to store personal items on their person during their shift. Garments that can withstand frequent washings are ideal for the food service industry. In addition, using heavy-duty materials means that employees will be safer in their environment as they’ll remain covered at all times. Non-slip shoes are essential for work in the food service industry. As spills, grease, and moisture in the air will cause the floor and other surfaces to become slippery, shoes that are made to withstand those conditions are essential to the safety of employees and overall sanitation of the workplace.